Our Capoeira Institute Southwest Regional Chapter is a non-profit arts organization whose foundation is built on honoring traditions and building connections. We inspire Tucson and the Southern Arizona region to strengthen our communities by engaging in the thrilling Afro-Brazilian art of capoeira and Brazilian culture. We provide workshops and event participation to economically challenged youth, public performances and festivals and ongoing training to promote cultural links and achieve excellence in mind, body and spirit. Funding provides scholarships for workshops and supports performances and events in Afro-Brazilian capoeira, dance, music, arts and culture. Help us bring excellent Afro-Brazilian arts programs to Tucson and Southern Arizona and make them accessible to all youth and families. 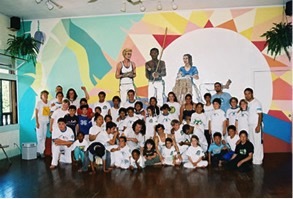 To promote cultural exchange between the United States, Brazil and other countries emphasizing both the creation of opportunities in capoeira as well as developing an understanding of capoeira and other Brazilian related activities for the underserved segments of society, especially disadvantaged youth. To continuously create and maintain an elite level of excellence with respect to techniques, rituals and tradition in training and performing capoeira and other related activities; To expose all levels of society to such activities with the intent of educate, discipline and integrate people of California, the US and abroad about capoeira, Brazilian culture and its diverse related activities.